We Go to Chuisi della Verna (again) | Sprezzatura, Y'all! Remember the blessing of the truffles? Well, ever since we went up to that place in the very late afternoon and came back down in the night, we’ve wanted to go back. It was dark, it was mysterious, it was VERY cool. We needed to know more. So we went up there the other day to have lunch. The place is Chiusi della Verna. There’s also a place called La Verna, which is even higher than Chiusi della Verna. La Verna is a santuario, which is a Fransican santuary, or monestary. It’s high and secluded and I can imagine what a wonderful place it is to mediate on what’s important in you life, or what you want to be important. It’s peaceful and prayerful. It was also wet when we went there. The weather changes here with the drop of a hat. It can be cold and rainy one minute and the next is bright and sunny. That day was overcast with some threatening clouds. It was beautiful then it was raining. 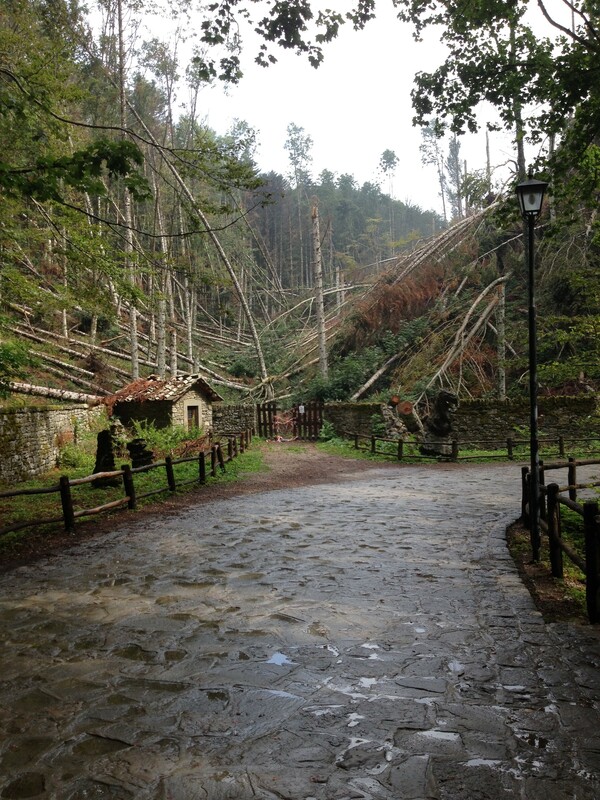 When we were at La Verna, it was raining. On and off. Enough to make it pretty miserable, but to also give an ethereal quality to the surrounding woods. This was high up. Everything was different up there. The air was thinner and clearer, the trees were different. You could tell you were up there. On the way up to the santuario, you walk on a stone path through the forest. We noticed all these trees that had been felled and we thought how odd that was. The more we looked at the pattern, we thought there must have been a storm that had come through and knock them down. Later we were talking with a local here and he said that in March there was a tornado that came through the area – extremely rare – but that caused the damage. The story goes that St. Francis met a wealthy man near Chuisi della Verna in 1213 and the man was so impressed with St. Francis and his message that he offered this mountain that he owned to him as a place of retreat. That place was La Verna. St. Francis reportedly spent a great deal of time there and it was there that he received the stigmata in 1224 on his last visit. 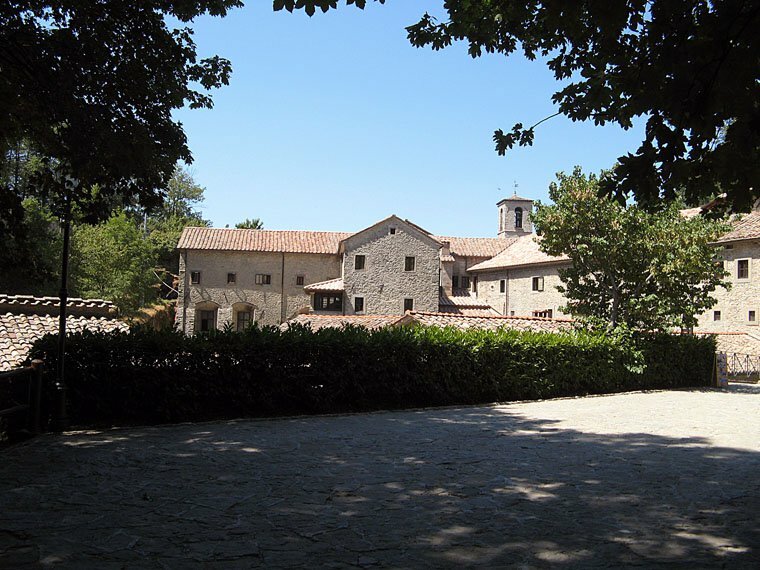 It is still an active retreat and monastery and every day the monks celebrate the stigmata at 3 pm by conducting a processional to the spot where the stigmata was received. Legend has it that once a terrible snowstorm prevented the monks from carrying out the processional and the next morning they found the footprints of all the woodland animals who made the trek without them. After that they built a shelter to protect them from the elements so that the they would never miss another day. Guests can stay here and retreat with the monks and all in all it looked like a fine place to do such a thing. After a lunch down in Chiusi della Verna we headed back home. Later that afternoon we closed on our house via Skype and a power of attorney (thank you, David). It was an emotional time for us, cutting the final official strings to our home of over 21 years. 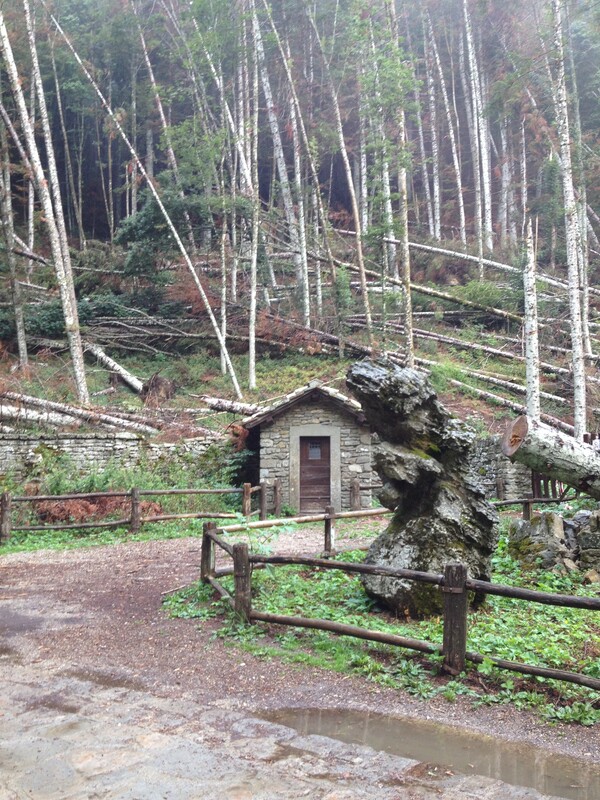 Then we thought how appropriate it was that we visited La Verna that morning and remembered how St. Francis relinquished his worldly possessions to more fully appreciate the grandeur of the natural world. While we don’t anticipate receiving a stigmata while we’re here, maybe we can gain a little perspective on what’s important in life. Thanks so very much for this information! What a beautiful place to visit especially knowing its history. There was certainly a reason for you being there on the day you closed on your house! You know, we really didn’t know any of that before we went up there, so it was divine intervention. Truly…you are surely on your right path! Thanks for sharing this cool experience. Thanks, Julie. Funny how things work out sometimes. beautiful Cathy! Im trying to follow your blog……..but I cant see where to do that.